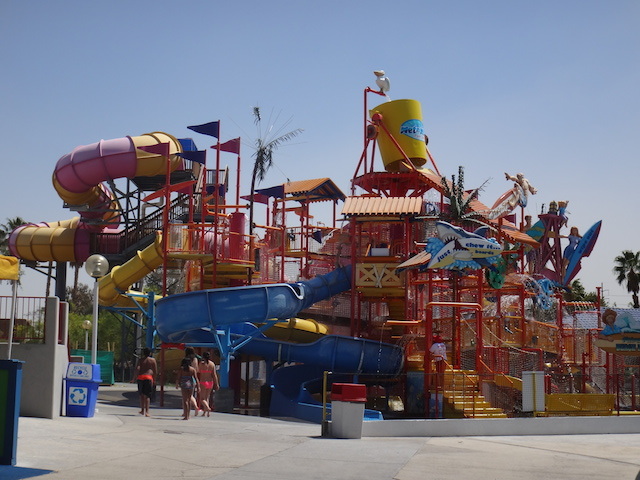 In our experience Wet ’n Wild operations are largely the same wherever you go, but certainly, Palm Springs is an ideal location for one. Open in spring and summer, Wet ’n Wild Palm Springs includes all you could ask for in an outdoor water park and a sure-fire activity when in Palm Springs with kids: plenty of slides and tube rides, daredevil slides with sharp drops, small slides for the younger set, a large water clubhouse/play area, and most importantly for my kids: a lazy river and wave pool. Note: Coming soon, Wet ’n Wild is adding a Wave Runner surf simulator. We saw construction ongoing during our visit, and wished very much it was already in operation! Given Palm Springs hot, dry climate, it came as no surprise to me that this Wet ’n Wild location offered more than the usual cabanas with shade and misters (available for an extra rental charge) and ample shaded seating and lounger areas (free of charge). Still, I’d arrive early in the day to snag a good spot. We found the park to be generally clean, and the staff to be friendly and attentive to water safety. An easy drive from I-10. General admission at the time of our visit was $36.99 for adults and $26.99 for kids 3-11. Hours vary significantly by season and day, so be sure to check the website for update information. Parking is $14 per day. Plenty of snack and quick-dining options abound in the park, including my kids’ favorite: Dippin’ Dots. Outside food is allowed at designated picnic areas just outside the main gate (get your hand stamped before exiting). We brought water bottles and small snacks into the park (our bags were checked and these items permitted). Tip: Bring your own towels and sunglasses, or you’ll pay dearly for these items in the park. From Palm Drive, take Gene Autry Trail. Continue south for approximately 5 miles. Wet ‘n’ Wild is on left just past Mesquite Ave.
As I disclose whenever applicable, we experienced Wet ’n Wild as guests of the park, for the purpose of review. Without compensated admission, many pit stop reviews would not be possible.